I don’t know how it came to be that sweet potatoes are my dish, but there’s no dish I’d rather claim. For one thing, they’re yummy…kind of a dessert on your dinner plate, really. Plus, sweet potato casserole is so easy to make. Sweet potato casserole is so easy to make that I’ve never actually followed a recipe. Every year when my family asks if I’m going to make the sweet potatoes—as if it’s some treasured family recipe we’ve handed down for generations—I say “uh huh.” And then I try and remember how I made them the year before. Until this year. Because this year, I am not making them how I made them last year. Because I used to put butter and eggs in the casserole. This year, I veganized it. This is my secret number two. Since my husband and I are hosting Thanksgiving this year, I’m going to veganize the dishes I prepare. And I’m not going to tell my extended family! I can almost guarantee they won’t notice. Not because they’re dummies, but because the revised dishes are even more delicious than the former, omnivirous version. This sweet potato casserole uses maple syrup in place of sugar…not a vegan thing but it is more nutritious than straight up sugar. Soy free Earth Balance replaces the butter and instead of thickening it with eggs I used chia seeds, which add fiber, minerals, and omega-3 fatty acids. Also, I used vegan marshmallows in place of the jet puffed ones. The result is smooth as pudding and sweet as candy—a perfect side dish to go with the rest of the stuff on the plate. My people are going to love it and yours will, too. Slice the yams or sweet potatoes in half. Brush with oil and place face down on a baking sheet. Bake the yams for 35-45 minutes or until the thickest part is completely soft. While the yams are baking, juice the orange and prepare the pecans. In a small skillet over medium-low heat, warm the chopped pecans. When they become fragrant, add the maple syrup, cayenne, and salt. Stir the pecans continuously until they are nice and toasty (they will smell really good when they’re ready) and the maple syrup coats the nuts. Remove the potatoes from the oven and allow to cool for five minutes. The skin will become wrinkled and loose. Remove the skin and any tough or fibrous ends. Place the sweet potatoes into a large mixing bowl with the orange zest, orange juice, maple syrup, pumpkin pie spice, Earth Balance, chia seeds, and salt. Beat well with an electric mixer for 2-3 minutes or until the mixture is smooth and very well blended. Scrape the sweet potato mixture into an oven safe serving dish and spread it around evenly, so the top of the potatoes is flat. Set aside for a moment. Slice 8-10 marshmallows in half and arrange them over the top of the sweet potatoes. 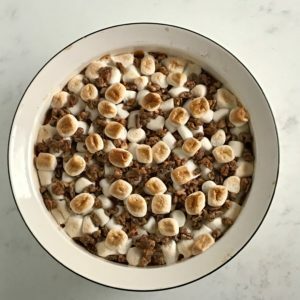 Sprinkle the pecans over the marshmallows. Bake, uncovered, for 20-25 minutes, until the marshmallows begin to look puffed and golden. *Maybe sprinkle the cayenne instead of actually pinching it, unless you want to risk cayenne in your eye, nose, or mouth. When buying your sweet potatoes, try and match them evenly in size and thickness to ensure even roasting. In case you don’t have any chia seeds, eliminate the orange juice. That will eliminate some of the moisture so you don’t need the seeds.